A very rare Caterham Seven K-Series 40th Anniversary with just 12,523 miles. Tubular space frame with aluminium honeycomb cockpit stiffening, aluminium panels and composite nose cone and wings, front adjustable double wishbone with anti-roll bar, rear De Dion axle with adjustable anti-roll bar, Bilstein telescopic dampers, weather equipment, Seven grille, Motolita steering wheel, alloy handbrake lever, heater, full instrumentation, numbered plaque Factory Options: Full S Type interior, four point harnesses, tonneau, handbag. The Super Seven was first exhibited at the London Motorshow in 1957 and to celebrate forty continuous years of production and development the 40th Anniversary Special Edition was available. Just 67 were produced all in distinctive Ruby pearlescent paint with a Silver bonnet stripe and black coachline to give the Anniversary Seven a unique finish. Each was fitted with a numbered plaque on the cars dashboard, this example being number 23. 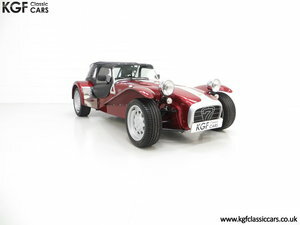 The model was available with the K-Series or the 2.0 Vauxhall engine and at nearly £20,000 for the latter it was one of the most expensive 7s produced at the time. 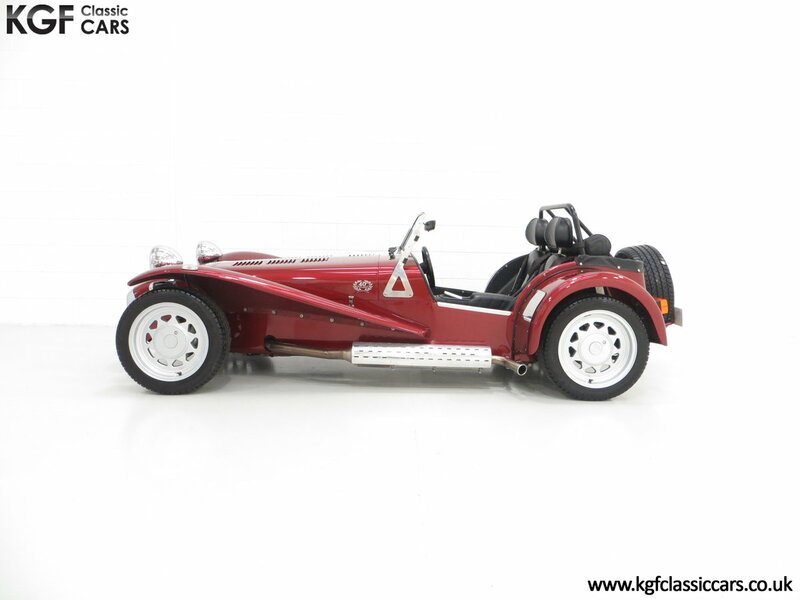 A sought-after and very rare Caterham. Truly spectacular finished in unique and sparkling Ruby pearlescent paint. The distinct Silver bonnet stripe extends to envelope the maw of the nose cone which incorporates the Seven logo, a cost option on lesser models. Full weather equipment remains in perfect condition as does the optional tonneau cover and handbag. All exposed suspension components are in excellent condition and even the blue Bilistein stickers are vibrant helping to prove fair weather use only. There is a small touched in mark to the offside rear wing. The chrome rear wing protectors are bright but have slight gravel rash and to the paint each side. The incredibly light aluminium bonnet is unmarked and proudly displays the 40th Anniversary logo to each side and the front indicator lenses have been changed to the clear type. 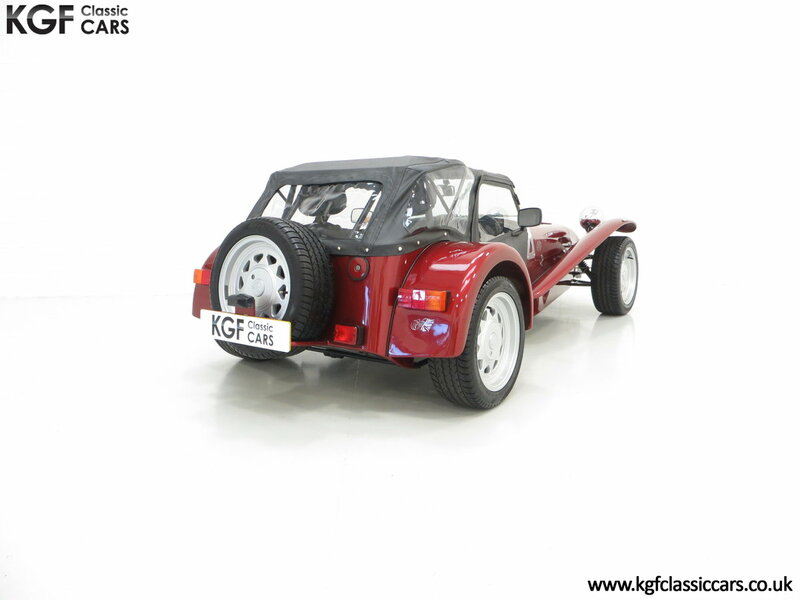 A very special Caterham. 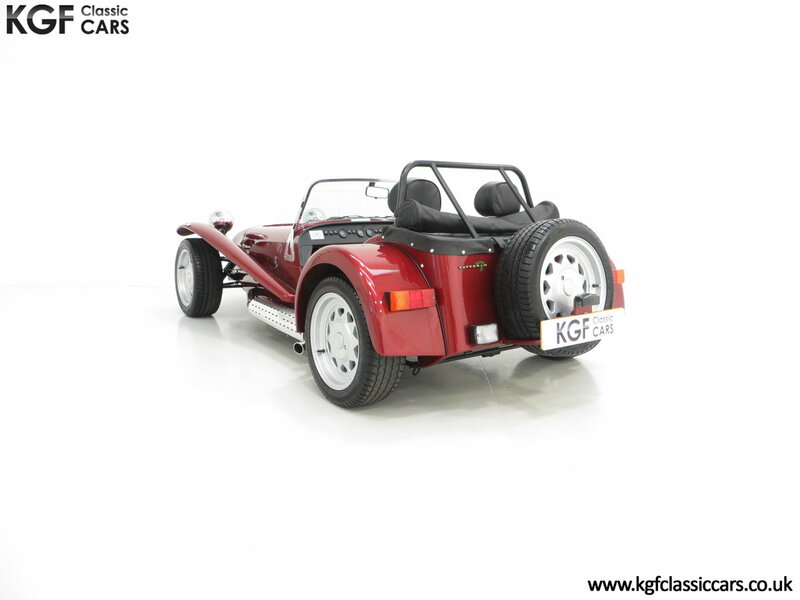 This rare Anniversary example is fitted with the expensive factory upgrade to full leather with the S-Type Trim option all in remarkable condition. This was a £998.50 option when new. 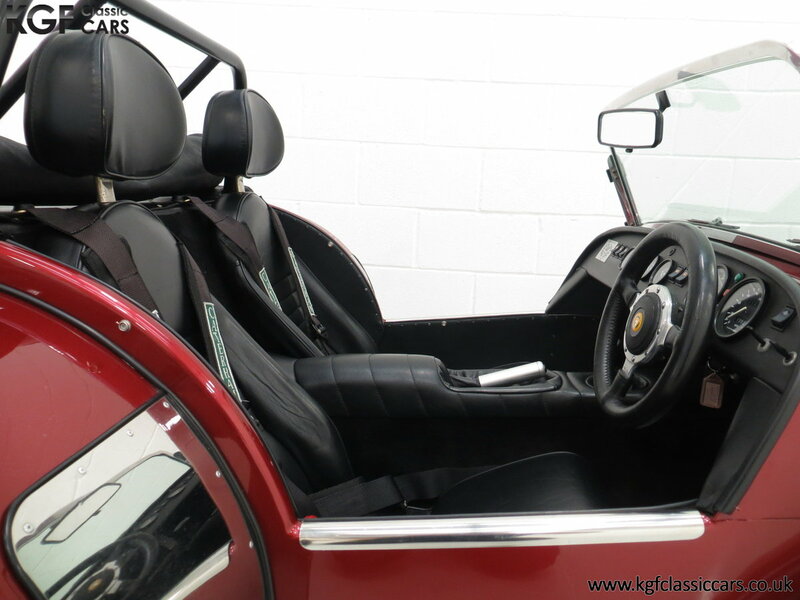 As standard it is fitted with the lightweight seats and the Motolita leather steering wheel and the numbered plaque on the dash reminds the driver of the exclusivity of this model. All analogue gauges reveal healthy readings and the heater and front heated screen are welcome features. The Caterham 4-point harnesses offer a securing embrace and all carpeting is clean with no wear. This is a truly wonderful exhilarating example which came fully specified from new. The Rover K-Series 1.6 litre MPI longitudinally mounted engine is factory standard and produces 115bhp, enough to propel this lightweight machine to 60mph in 6.2secs and on to a top speed of 108mph. A recent cam belt change in 2018 and replacement of the foam baffle in the sump will help ensure optimal performance. The 4-branch manifold and silencer creates a glorious sound with an intoxicating and addictive bark. The 5-speed gearbox provides short, snappy accurate shifts to complete the thrilling package. 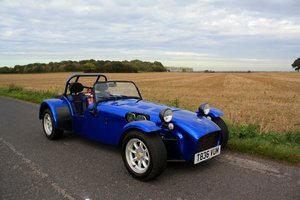 Immaculate Caterham Prisoner-style 15inch alloy wheels fitted as standard are shod in matching Michelin Pilot 195/50 R15 tyres all with ample tread including the rear mounted spare. A twin circuit split front/rear braking system with 228mm discs to all four corners bring this lightweight machine to an assured safe stop quickly. 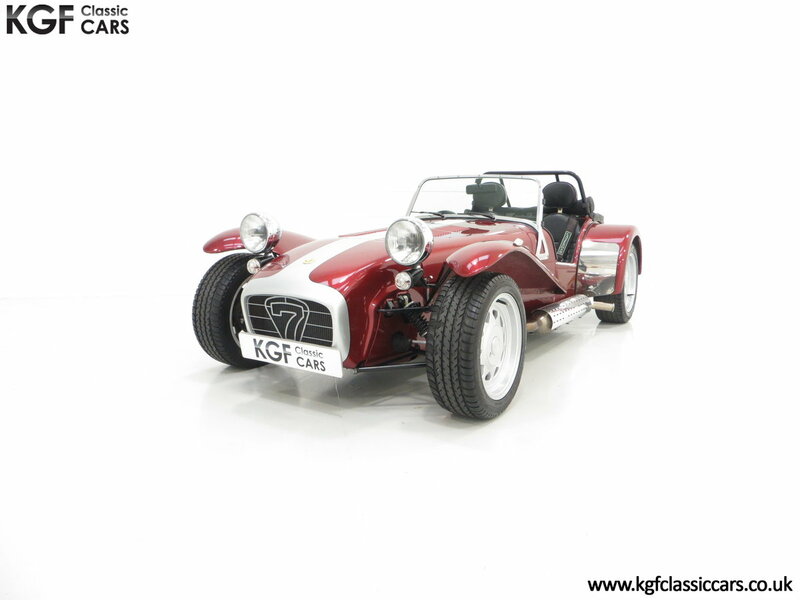 With only 67 Caterham Seven 40th Anniversary Editions made this exclusive model is a rare sight. Registered new on the 1st May 1997 to Mr M Brend and with just two former keepers since, every MOT is present to verify the low 12,523 miles covered. The original service book is included showing stamped service entries with the last being in April 2018 by Lotus and Caterham Specialists, Vincent Haydon. A cam belt change was also carried out at this time with the car having covered 11,820 miles. 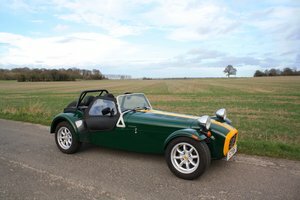 With up-market specification, historical significance and low units supplied by Caterham this really is wonderful opportunity into Caterham ownership with added exclusivity. 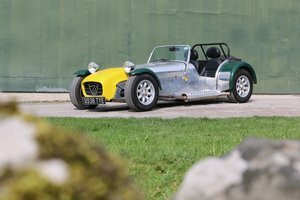 Caterham Seven Vauxhall Classic, 1999. 5 Speed. 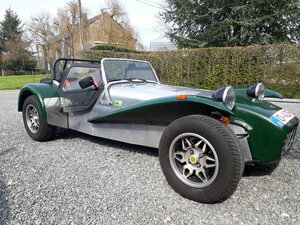 RHD Caterham seven 1700 supersprint registered in Belgium with hood, side doors and tonneau cover. Very good state.